It often happens, that I pay attention to something beautiful and it comes to my life after a while, or sometimes, a long while. 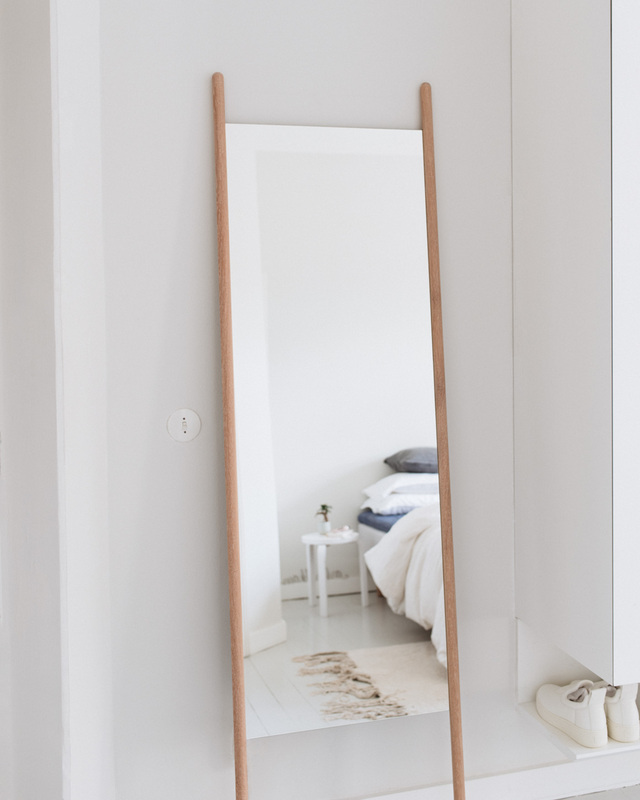 Georg Mirror by Skagerak was an easy choice when we were looking for a simple, lightweight mirror for where we dress up. Before getting one, we spent good times hopping in front of a small mirror on the back wall of our utility room to see if the chosen outfit looked decent enough for leaving the house. When we were ready for a change, we dropped in Formverk on our Saturday stroll and had the mirror delivered to our home the same afternoon. It was re-love at first sight. I had seen the piece years before but had forgotten about it since I did not need it back then. Simple and airy in design, the mirror serves as a nice contrast to the more stable and heavy elements of our bedroom: the row of closets, the large bed, the earthy rug, the plump rocking chair. Large mirrors are a classic way to introduce light and different scenes to a room. Placed opposite to a window with a nice view, the mirror serves as an extra window duplicating the landscape. To find the right spot, look from different angles and make sure you enjoy what the mirror reflects. Another big thing for sustaining the harmony of the room: keep all mirroring surfaces clean. In good and worse, mirrors highlight and duplicate everything.